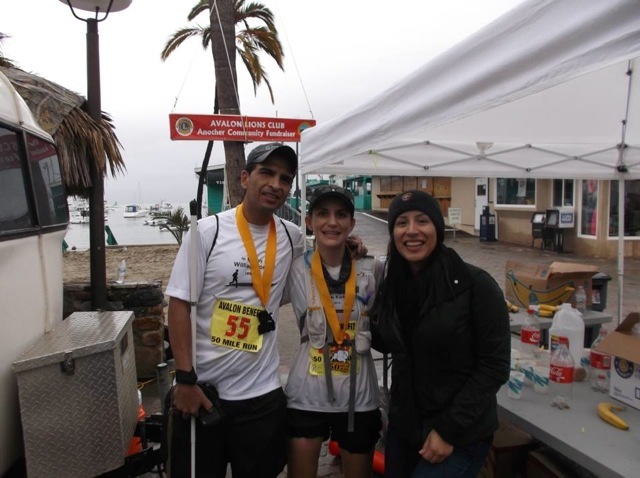 In January I had the honor and privilege to pace/crew my friend Miranda at the 2015 Avalon 50 Mile Endurance Run. I first met Miranda in March of 2013 through our mutual friend William Korthof. Miranda who lives in Glendale, graciously allowed me to stay at her home the night before the 28th Los Angeles Marathon so I wouldn’t have to ride the shuttle from Santa Monica to Dodger Stadium. Earlier last year, we were all excited when Miranda announced she had registered for this challenging event. 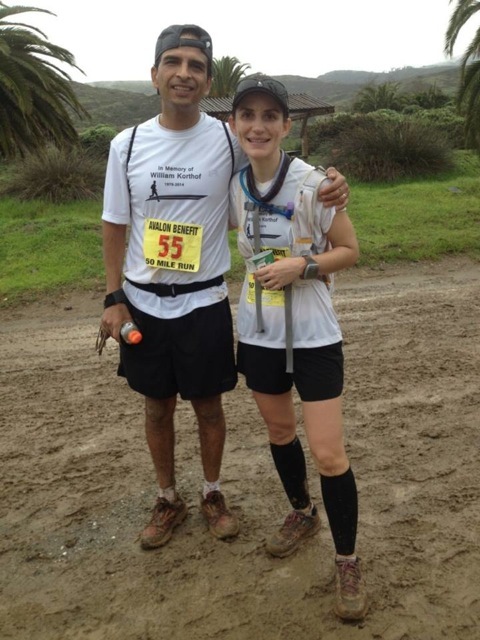 A seasoned marathoner, this would be her first 50-mile ultra. In preparation for it, she had run a couple of 50k races. Miranda’s training was going very well until William was tragically killed on October 2, 2014. Everyone who knew William was deeply shocked and saddened by his unexpected passing. As the sad days turned into weeks and the shock wore off, Brenda and I tried to think of ways to honor William and to take care of Miranda who was not eating or sleeping. After a text exchange with her, we were surprised to learn she was still planning to run the Avalon 50 and that she would be running it by herself. We were concerned about her plans but then it occurred to us that helping Miranda along her 50-mile journey would be the best way to pay tribute to William who selflessly guided me though dozens of races. Back in April of 2013, William guided me through the last 23 miles of the American River 50 Mile Endurance Run. On the second half of that race, he patiently kept me safe and motivated through the treacherous single-track trails which forced us to walk for long stretches. Soon after that experience, I asked him if he would guide me at the Avalon 50 one day. As always, William agreed to guide me. Little did I know then that just a year and a half later, I would be carrying on his legacy by pacing Miranda. Although I had heard that the Avalon 50 was a challenging and hilly course, I had also heard that it would be wide with mostly graded fire roads. To me this meant the freedom to run alongside Miranda without worrying about tripping or falling. More importantly, Miranda wouldn’t have to worry about me. As race day approached, we realized that it would still be dark on Catalina Island at the 5am start. Running in the dark is an additional challenge for me. I had done it three times at the St. George Marathon. In 2008, it was William who guided me along the desert highway where I couldn’t make out anything. We were tethered until dawn when I could see more and then I could follow him. With Miranda running 50 miles, I knew I wasn’t going to ask her to guide me at the start. I didn’t want her to expend any unnecessary physical or mental energy so we had to come up with another option. On my own dark training runs, I have worn flashing lights to make myself visible to motorists. This gave me the idea of using these lights in reverse — putting them on Miranda. Instead of being caution lights for me, the pulsing light would act as a beacon and I would be able to follow her. 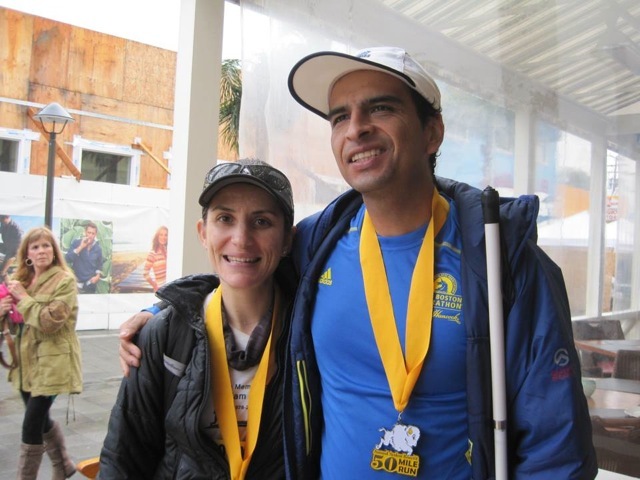 Miranda had asked for a training run so she could practice running with a visually impaired runner. I didn’t think this was necessary since I would be running at her pace and I had trained on wide fire roads for the AR 50. I then realized running on trails in the dark was something I needed to experience before race morning. With this in mind, we decided to go on a practice run after dark on the Westridge trail near where I live. This run was a great confidence builder for both of us as we bonded and discovered each other’s strengths on the simulated course conditions. Leading up to Miranda’s race, I was not so sure I would be able to live up to the challenge. After running 2:55:38 at CIM back in December, my training was sporadic. 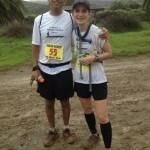 I only managed to get in a 13-miler and 17-miler as long runs prior to the Avalon 50. At a slower pace or not, 50 miles is still a long way to go. After weeks of anticipation, race weekend finally arrived. I met Miranda and her parents in the parking lot near the Griffith Park train and pony rides because it was a convenient location. It ended up being memorable because William and I, along with many of our closest friends had done long runs together around miles of trails, the observatory and the Los Angeles Zoo. Although the race day weather forecast called for scattered showers throughout the day, we lucked out with a cloudy and a comfortable 55 degrees at the start. With only 263 participants, the start of the race felt a little anti-climactic to me. There was no official start or finish line. In comparison to the American River 50 which had an announcer, music and a count down to the gun going off, the start of the Avalon 50 felt more like the beginning of a long training run. Nevertheless, I was excited that we were finally off on our 50-mile journey. Our race strategy was to start at the back of the pack to warm up and not go off too fast. As we were running a 12-minute per mile pace, I had to remind myself that this was Miranda’s race, and that I was there crewing for her. This helped me fight the urge to pick up the pace and start passing people as I have done on the few occasions when I’ve gotten stuck in the back of the pack. Before the race I told Miranda not to worry about me. Using a tether would have been taxing on her and really not necessary. My plan was to follow the bright illumination of her flashlight and the blinking light on her back. As expected, we ran in the dark for the first hour and a half. It was a little difficult for me to stay with her at first but then I started figuring stuff out as we went along. I also relied on listening to everyone else’s breathing and conversations to know where I was in the pack at all times. My strategy worked for the most part except for a couple of times when Miranda got away from me on the down hill portions. I managed to catch up to her on the flats every time. Little by little we made our way to the middle of the pack where runners were more spread out from each other. As it got lighter outside, it was easier for me to run by Miranda’s side and actually start pacing her. Miranda’s racing strategy was to run the flats consistently, power-hike the steep inclines, and to make up some time on the downhill portions of the course. I was really impressed by how well she stuck to her plan. For instance, we would go from running a 13-minute hilly mile to an 8-minute mile on a mostly downhill one. It was at these transitions that I had to make a conscious effort to keep up with her. Although it had only drizzled on us for minutes at a time for the first 20 miles or so, that changed in a hurry. 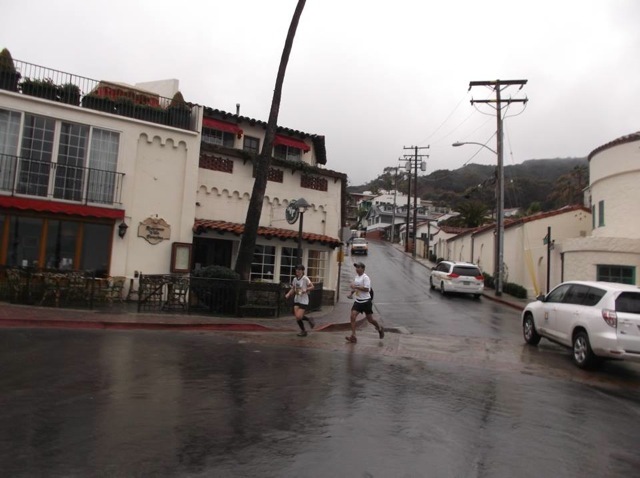 By mile 23, it began raining hard and the temperatures dropped. This made the race more challenging as we were now soaked and cold. The fire roads were now getting muddy and very slippery. At about mile 27, parts of the course that had only been slippery were now long stretches where we had to walk because we were ankle-deep in mud. This ended up being fun since we were tired. Struggling to stay upright and maintain our balance made us laugh. I imagine that we probably looked like a couple of drunks. Miranda managed to stay on her feet but I did fall a couple of times. She was concerned but I just laughed it off and kept a good attitude. The course was out-and-back but we had a different route for the last 20 miles of the race. The roads on this section were a little easier to navigate as they were inland so they had a little more gravel on them and were less muddy. We also enjoyed different scenery on this part of the course. Miranda described farms, ranches and churches as we ran past them. Along the way, we even spotted a couple of buffalo grazing by the side of the road not more than 15 feet from us. I could actually hear their breathing and their hoofs on the ground. Although I was carrying a small backpack full of snacks for us, we made a point of stopping at every aid station to grab a drink or to use the porta potties. Around mile 40, I even got a buffalo burger patty with cheese and a bottle of beer. This was the first time I’ve ever had any alcohol during a race. Surprisingly, it turned out to be a good idea as it settled down my stomach and did not give me a buzz. As fatigue and cold began to set in for me, I had to dig deep. For the next seven miles, I made sure to keep jogging slightly ahead of Miranda when she power-hiked the uphills. Besides motivating her, this move helped me stay warmer and expend less energy. Before this point, I was wearing myself out by falling back and then running to catch up to Miranda on the uphills stretches. I may be a faster runner, but she is a stronger power-hiker than I am a walker. With only three downhill miles to go, Miranda got a second wind. She really put the hammer down by running the last stretch at a 9 minute per mile pace. When she surged, I made sure to stay back and follow, so I would not get in her way and slow her down on the turns. Once we made it back to the paved streets in town where the retail shops and restaurants are, I caught up and finished alongside her. 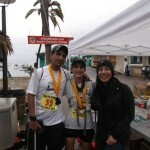 We completed the race in 10 hours and 22 minutes which was good for 96th place out of 263 participants. I’m so grateful to Miranda for the opportunity to give back. 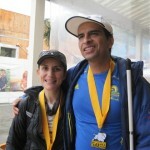 Over the years, I’ve benefited tremendously from the kindness and selflessness of many guide runners across the country. It was amazing to be able to return the favor this time. This was the perfect course for me to pace as I did not need much assistance navigating it. The wide and mostly even fire roads made it easier for Miranda not to worry about my safety during the race. Not too many people would have trusted a visually impaired runner, faster or not, to pace/crew for them. It was incredible for both of us to honor our friend William’s memory running as a team and overcoming all the challenges along our journey.